Worked on 18-count deep blue aida, this box is lined in palest pink, and the sides decorated with a design of roses and silver lattice. 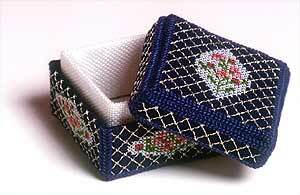 This design uses only full cross stitches and backstitch. There are no fractional stitches or french knots.